Hey Phil – Thank for the free downloads! I know this stuff takes time so I really appreciate these. No problem! You’re quite welcome. Hi Phil, I notice you said the free option is good enough but you can’t list your website unless you upgrade. In your opinion do the search engines cross check the business name and contact details and decide that is enough to rank you better or do we need to upgrade in order to get the website link? 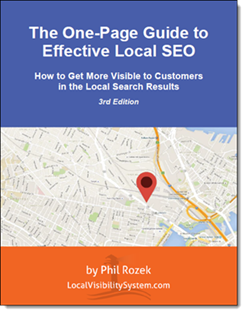 It’s the case with the LocalEze.com free listing that you can’t specify your website (you can only do it if you get a paid package). But you can specify your website on your ExpressUpdateUSA.com listing (which is free). I’ve found that the link / “Your Website” field just doesn’t affect your rankings. The core info in each citation that matters is the name, address, phone, and category. The free InfoGroup (ExpressUpdateUSA.com) and LocalEze listings are more than good enough. Thanks this is exactly what I’ve been looking for!!!!!! The list you have posted is now over a year old any idea if there has been new categories? Sure thing, Dale. Thanks for a good question!